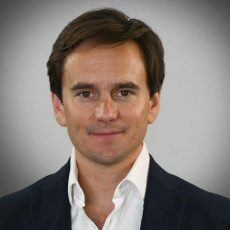 After graduating from Durham University in 2001, Richard travelled extensively across Russia, China, India, South East Asia and South America before qualifying as a chartered surveyor with Jones Lang LaSalle (JLL). In 2009 he established Bywater Properties, a London-based company focused on cross-sector UK property investment and development, of which Richard remains Chairman. In 2012 Richard joined Iceland Foods, the company established by his parents Malcolm and Rhianydd in 1970. He worked full-time as a shelf-stacker and cashier in Iceland stores in London for a year, before becoming a store manager in Swiss Cottage and moving to Iceland head office at Deeside, Flintshire, in 2013. After various head office roles, including a spell running Iceland’s International division, Richard became Managing Director of The Food Warehouse, Iceland’s chain of more than 70 larger format stores, in 2015. He was promoted to his current role as Managing Director of Iceland Foods, with responsibility for both Iceland and The Food Warehouse stores, and for the Group’s property and people, in August 2018. Since November 2017 Richard has taken the board lead on sustainability issues across the Group. Under his leadership, Iceland has taken a range of world-leading sustainability initiatives that include becoming the first major retailer globally to commit to eliminating single-use plastic packaging from its own label range, to be completed by the end of 2023; taking action against continuing destruction of tropical rainforests as the first UK major UK supermarket to announcing the removal of palm ingredients from its own label food by the end of 2018; becoming the first UK retailer to adopt the Plastic Free Trust Mark; and being the first retailer to install trial Reverse Vending Machines for plastic bottles in stores in England, Scotland and Wales. Richard is a Trustee of the ‘Iceland Foods Charitable Foundation’, and the conservation group ‘Fauna & Flora International’. He also sits on DEFRA’s ‘Council for Sustainable Business’ and Greenpeace’s ‘Ocean Advisory Board’. Richard is married with two daughters. Outside family and business, his greatest passions are trail running, skiing, surfing and climbing all over the world.